I have a Passat 2001, (B5 passat TDI 2001) I bought it from new and have done so far 330.000 km or 200.000 Miles. I noticed that every morning (since 2 months or so) as I get the car out of the garage there is a spot of oil on the floor, the size of a coin, after checking the oil gauge it does not seem to loose any. I took it to the garage (not a VW dealer) and he believes it comes from the turbo, so it would have to be changed. First of all, is the diagnostic correct? Second is it that much of a major issue to loose so little oil via the turbo? Thirdly, whether it is worth the investment or should I scrap or sell it of and buy another car all together, since the value of the car in todays market is next to nothing ?? In the 12 years I’ve had the car, the only 2 big jobs (at least costly ones) have been the head Gastket around 150.000 miles and the heating which had stopped working some 6 years ago but for info, the engine temperature gauge and the heating has not (AGAIN) been working for the past 1 year or so, to give you max info on the situation! So this is where I am at, Repair the car and hopefully keap it for another 1 to ? years or replace it with another car (it will not be a Passat, I do not have the fund but replace it with some other smallish and fairly new car)? I have attached photos showing the engine below where it leaks in two areas and one photo of the engine showing the turbo. Welcome to the forum Patricia. 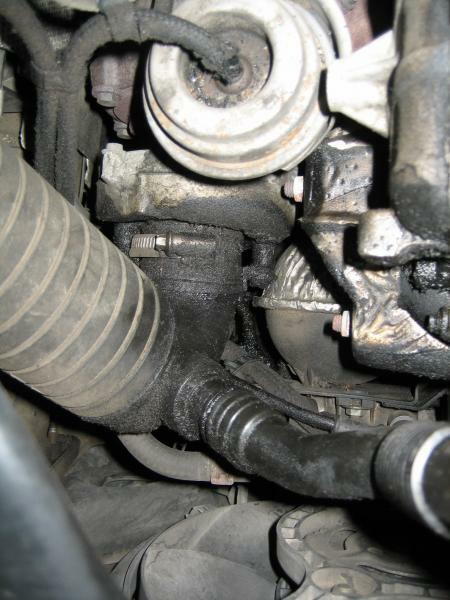 It could be the oil feed pipe that's leaking or something else at the back of the engine. It the main seals of the turbo are leaking then you wouldn't see any oil on the floor as its burnt in the engine or exhaust. Get all the oil and crap cleaned of so you can see where its coming from. A reconditioned turbo in the UK is about £600 plus fitting.